Born in Albania, the German pianist and conductor Desar Sulejmani attended the Folkwang University of the Arts in Essen from 1998 until 2008, studying the piano with Prof. Till Engel, chamber music with Prof. Andreas Reiner and conducting with Prof. David de Villiers. Desar Sulejmani’s artistic development significantly benefited from numerous international master classes. Sulejmani performs all over Europe, both as a solo pianist and as a chamber musician. This activity has recently been documented by a CD featuring all of Felix Mendelssohn’s violin sonatas, released by FARAO Classics in Munich and recorded in partnership with violinist Andreas Reiner. 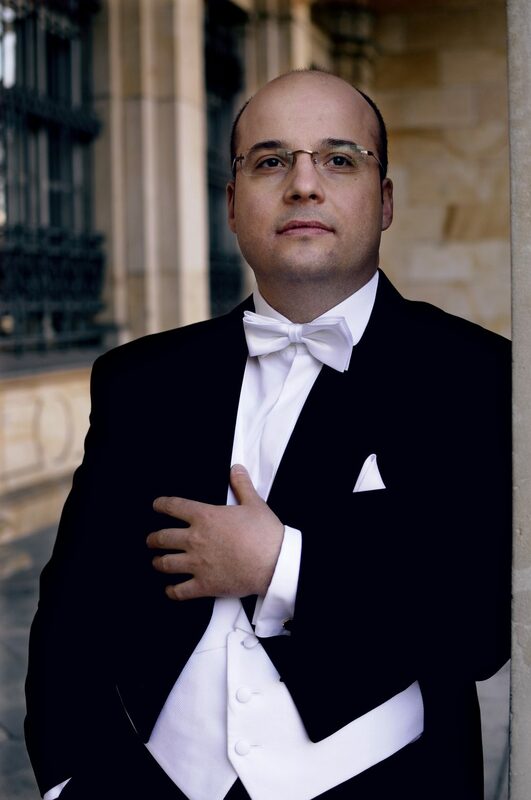 Desar Sulejmani has made appearances as a conductor both in Germany and abroad since 2003. To date he has conducted such ensembles as the Bochum Symphony Orchestra, the Bergisch Symphony Orchestra of Remscheid and Solingen, the Neue Philharmonie Westfalen of Recklinghausen, the Folkwang Chamber Orchestra of Essen, Rotary-Orchester Deutschland, the Kosovo Philharmonic, the National Symphony Orchestra of Uzbekistan, the Albanian Radio and Television Symphony Orchestra and the Symphony Orchestra of the Albanian National Theatre of Opera and Ballet. In October 2010 Desar Sulejmani received a scholarship from the first international conducting academy “Orchester und Stimme” (orchestra and voice), organised by the Bochum Symphony Orchestra as part of the Ruhr.2010 — European Capital of Culture. Various guest performances as a conductor and pianist have taken Desar Sulejmani to Essen, Cologne, Wuppertal, Tirana in Albania and the Alisher Navoi National Opera Theatre of Tashkent, Uzbekistan. From 2009 to 2012 he was also a member of the artistic team at Musiktheater im Revier in Gelsenkirchen, working as deputy choir director and rehearsal pianist. Desar Sulejmani has also held the position of artistic director and conductor of the Cologne Orchestra Society (2012–2017) and the Chamber Orchestra of Gladbeck (2013–2016). Furthermore, he directs the Heinrich Heine Symphony Orchestra of Düsseldorf and the Symphonic Wind Orchestra of Essen. In 2016 he directed an international production of The Magic Flute at the Joburg Theatre in Johannesburg. For some years now, he has increasingly worked with soprano Caroline Merz, both in Germany and abroad, as a teacher of song interpretation and opera rehearsal accompaniment. Since October 2012 he has also taught piano and rehearsal accompaniment at the Folkwang University of the Arts in Essen. Desar Sulejmani has worked as artistic director of the European Summer Music Academy in Kosovo since December 2014. He was appointed the new artistic director of the Pro-Klassik concert series in Königswinter in April 2017.